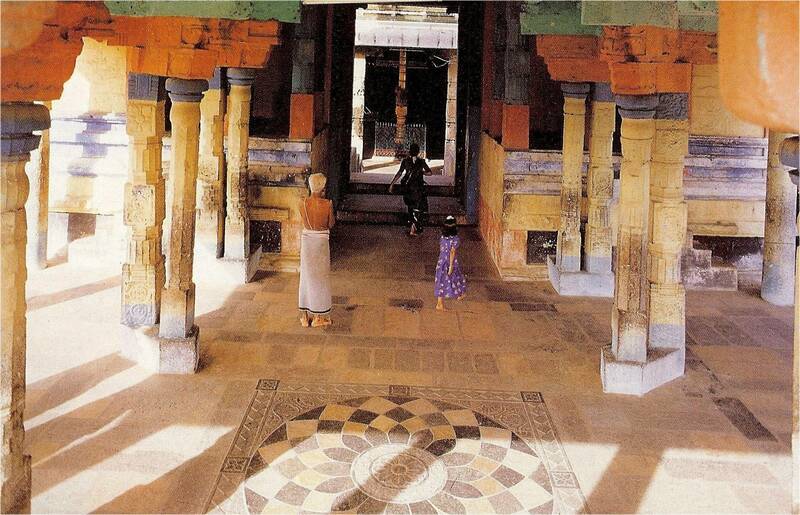 I was going through my book storage the other day, and I found this nice photo article I kept on the Chidambaram Temple, which has a lot of photos of which a few of them I thought I would share (see below) since you are not going to find these photos on the internet, all from 1993. 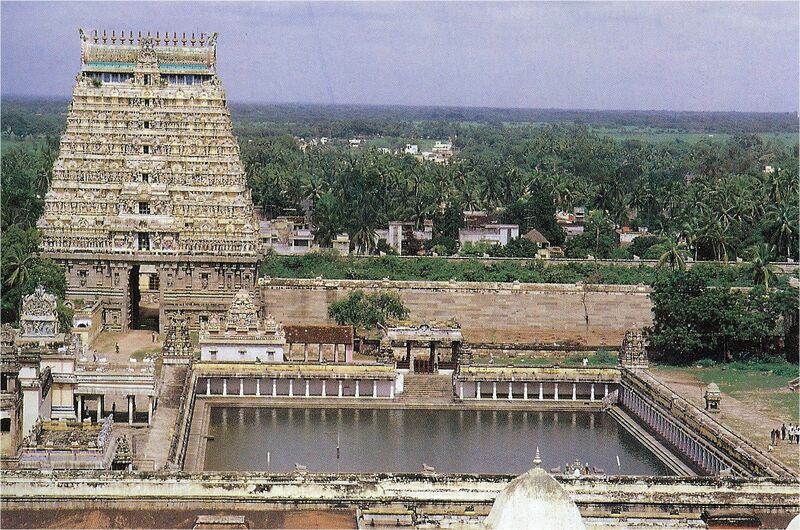 I have not been to Chidambaram Temple, but it is definitely on my list of travels, hopefully soon. 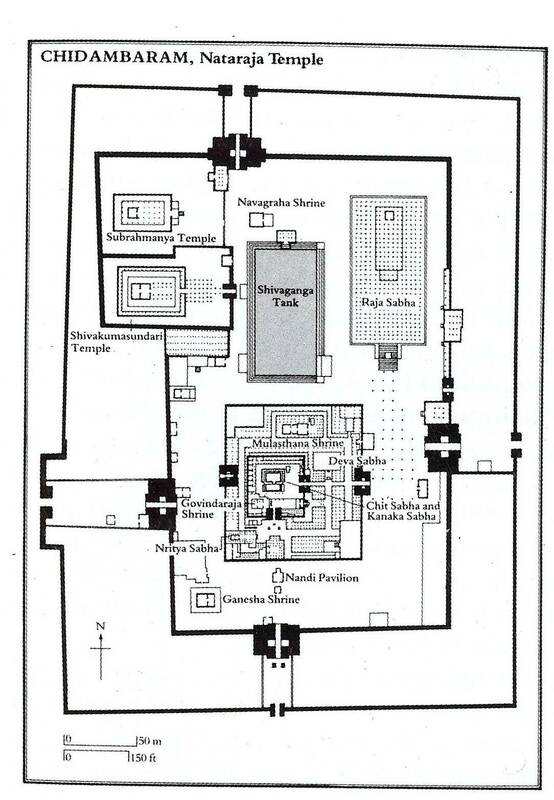 Actually, the article has a lot of photos, but I can only share five photos total in a posting, so I selectively chose the diagram (above) as a link to the diagram, and five very interesting photos that have views, but more interesting also are some of the art panels found in the temple complex. Chidambaram has always been the center for the worship of Nataraj, also known as Sabhanayaka or Lord of the Sabha going back to the olden times. This site has been important since the Pallava time, even before that actually. In Tamil Nadu, a temple is called koyil. The site has other names, such as Tillai since here was first a forest of tillai trees (Excoecaria agallocha). It has also been known as Pulliyur or the place of the tiger-footed Vyaghrapada. This is a mystical sage from long, long ago in ancient India, this Rishi would pick flowers untouched even by honeybees to offer Nataraj but because his feet would be often pricked by thorns of the area, Lord Shiva gave him the feet of tigers. “Chirrambalam” means “little hall”. Shiva danced here to celebrate his victory over ritualistic minded ascetics. You will see images of the “four Tamil saints” in locations of the temple complex, who composed hymns of rapture upon seeing the dance of Shiva. In fact, some of the hymns which come from the Tevaram are sung by laymen during the “sayan kalam” or second prayers of the evening. Singing is an established feature of this temple since the time of the Chola King Rajaraja the 1st, even before that. 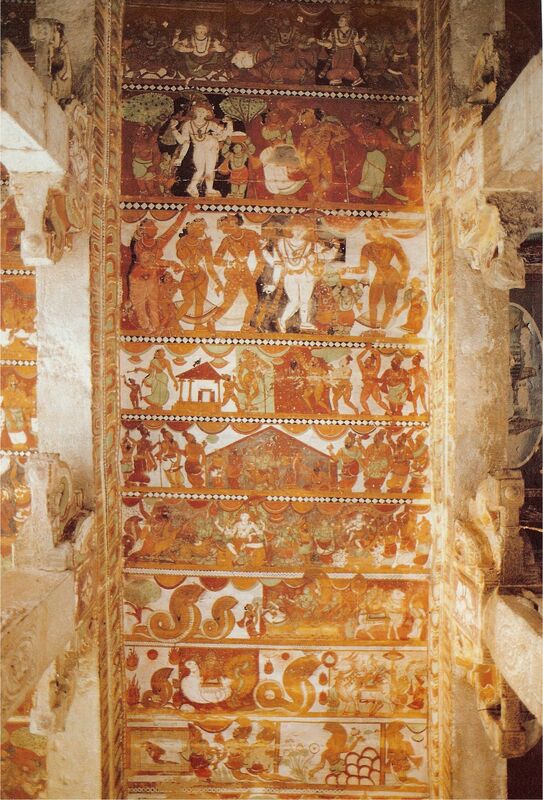 The 63 Nayanmars or Shaiva Saints who are commemorated in the “Periya Puranam” have their images set out in one long row against the North Wall of the second prakara or corridor. 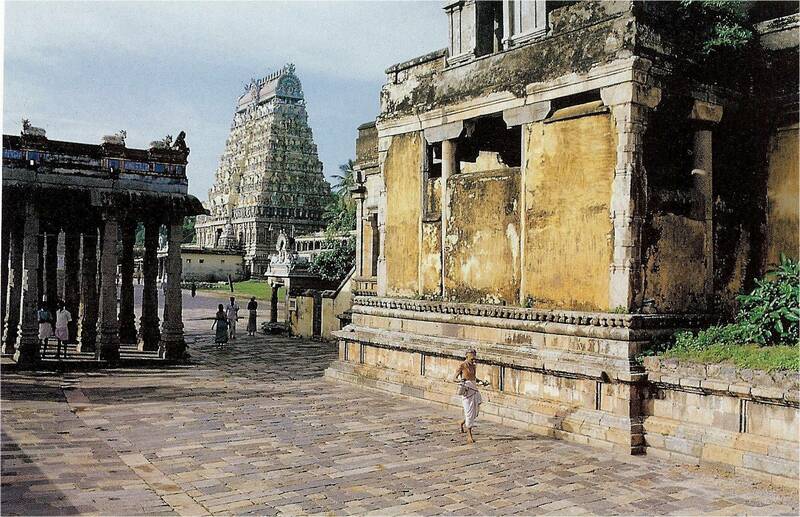 To the Chola Kings, Nataraj was their family deity or kulanayaka, and many Kings have been crowned in Chidambaram. The gopuras or gates to the complex are very elaborate. Some aspects of the temple had to be restored after the Delhi armies caused destruction. Here is the location of the “akasha” Lingam (space). The formless Linga is in the Chit Sabha beside the image of Lord Nataraj. The four gopuras are each 42 metres high. The largest building is known as the Raja Sabha or also known as the “Thousand-Pillared Hall”. As part of worship, there is a form of Shiva here as Shiva’s Sandals or padukas. These are golden, in the past it is believed there were ivory ones. In the morning, the padukas are escorted by palanquin to the Chit Sabha, the house or Sabha where within wooden walls and wooden pillars and copper-plated doors is found the Mukhalinga or the Linga of Brahma’s chopped off head, paraded with the sounds of reed horns and drums. There is also a crystal Lingam found here, and a ruby Nataraja 15 centimetres high. A camphor puja lamp is specially used to shine the light of the flame through the ruby. Yantra is also worshipped called Shri Chakra with nine interlaced triangles with Nataraj and Shivakamasundari living in it. Shivakamasundari is the beautiful Green Goddess who is partnered with Lord Nataraj and a manifestation of Uma. I am particular to all manifestations of the green-complexioned Devi, this is another reason my dream is one day to go to this temple. It is said all the Devas come here to worship. Lord Shiva is also of a manifestation of a bhikshu, or mendicant, who wanders about for alms like a beggar. This is also considered an aspect of Bhairava, and Lord Shiva took to the practice of Bhikshu after he cut off Lord Brahma’s fifth head. Here He is considered a Kapali Bhikshu, carrying Brahma’s Skullcap or Kapala as His begging bowl. I am particularly attracted to this form of Lord Shiva. Upon reaching His own City Never Foresaken by Shiva, known as Varanasi Kashi, He completed His example of Bhikshu. We must honor and respect the true bhikshus. Kamasundari took the form a Kamakshi in order to get Shiva to notice Her while he was meditating. She then took the bow and arrows of Lord Kama Dev. She approached Shiva thus adorned. Upon seeing Her, Shiva’s love was true. So She was to be known as Shivakamasundari. The Lord is seen as Nataraj, the Lord of Dance in this case, who Resides in Chidambaram with His Goddess Shivakamasundari. The story and meaning of this dance, and what each sacred possession He holds in His hands as Nataraj is a long explanation for another time. Thanks for sharing the beautiful pictures and the text along with them. Yes, it's a nice place, and I do hope you get there one day soon as well. I'd say it's definitely one of the more interesting temples of many there in TN. I'm lucky to have an old friend who lives a km or so away. Our temple here has a unique connection, as our lingam was sanctified there before it's long journey home to here. It's quite small, but many have commented how strong it is, even for a small lingam. Most don't know the whole story like I do. It is always exciting to see that members have this Temple (as well as other in TN) in mind and of interest to see photos, hear the histories, or who have even gone there or have a connection to the temples in TN. EM, what you say about your Lingam is amazing! It truly must have the power of the Lord. For some reason, I have been thinking about this particular temple for sometime now, but also Meenakshi Temple. But also ALL the temples! I have been to temples in Vrindavan and other parts of North India, and of course in WB, next must be South India and Mauritius. There are lay people like me, who really like temples. Just to see the temple grounds is a fascination that will take up an entire day! I like temples of every denomination. And I like when members tell us about temples in this section of the forum. For lay folks like me, temples are extremely important though we are not scholars on the sacred texts (not me, anyway) but we can be scholars on the Devas and Devi and the tirthas and the temples! Nice pics...actually i have planned to visit chidambaram temple next week. I use this site to know about temples around TN and try to visit them when ever i can.maybe this will be of use to you? Not my intention to barge in on what is obviously a shaiva thread, but I have been here many times, the latest being 2012 and wanted to add my experiences. There is a Vaishnava divya desam within the temple complex. Bhagavan there is Govindaraja Perumal. His consort is Pundarikavalli Thayar who has her own sannidhi as well. The shaiva section is called 'chiRRambalam', whereas vaishnava section is called 'thiruchitrakootam'. Two azhwars have waxed eloquent on this perumal. Kulasekhara Azhwar summarizes the entire rAmAyaNa in his pathigam. Thirumangai Azhwar, in his praise of this perumal, asks all tapasvIs to stop doing panchAgni vidyA penances such as living on air and roots, meditating on the five fires and instead come to worship Govindaraja, which will confer the fruits of all these penances automatically. The sthala puranam of this shrine is common to both shaivas and vaishnavas and I will state it here. Once, Shiva and Parvati had a dancing competition. They invited everyone to see their dance and Brahma was made the judge to see who was better. Brahma, however, was unable to make a decision and told them to dance in front of Vishnu. So, they invited Vishnu and danced. While dancing, Shiva lifted his leg in typical 'tAndava' pose. Parvati, being a lady, was shy to do that. Upon seeing this, sriman nArAyaNa declared Shiva as the victor. Parvati was angry and assuming the form of kAli, went away to a place near chidambaram that is now known as 'thillai kAli'. Then, after she and shiva had settled their differences, Bhagavan vAsudevA named Shiva as 'Nataraja'. Shiva asked Bhagavan mAdhavA to come and stay at this place as well, so he acceded to the request and became known as 'Govindaraja'. Is this sthala purAna true? The idea is that the apaurushEya vedA is pramAna. Whatever contradicts the vedA is rejected. This story does not contradict the vedA and is accepted. All temples have such sthala purAnAs. Of course, we vaishnavas will argue that the Govindaraja Sannadhi is observed to be slightly above the Shiva sannidhi and Bhagavan Govindaraja, in a lying posture on Adi Sesha, has his lotus feet directed towards the Nataraja Sannidhi, ie, at Nataraja himself. Though, Shaivas will not accept it! Hope I didn't spoil your thread with that one! This sthalam was also the witness of famous vedAntic debates in the past, such as that between Sholingur mahAchArya of Vishishtadvaita and Appayya Dikshitar of Shaiva Advaita. The shaiva section follows the shaiva agama-s whereas the vaishnava section follows the pAncarAtra agama-s. So, whether you are shaiva or vaishnava, a visit to this temple and worship as per your inclination, vAsanas is a must! Last edited by Sri Vaishnava; 15 May 2013 at 08:15 AM. Of course Vaishnavas are invited to post in "Saiva threads"! I am a Saiva, but Vaishnavas are beloved to me, and while there are "categories" structured into the forum there are no closed doors or exclusive clubs specific to any relative of the Hindu Family in any category. At least I hope not! I really enjoyed your sharing of the dancing contest. Actually, Lord Ganesh is probably the best dancer IMO and if He was part of the contest I think even Nataraj Lord Shiva would be in big trouble. I was told once that Devi is actually the best dancer but She only gives Shiva the advantage because Gauri is a good wife but never forgets Her aspect of Shakti and certainly is ready to dance on the corpse of those things past or future, and will even dance ON Lord Shiva in somecases. But Gauri is "secretly known as Natarani". But don't ask me to quote Veda on that! Since the Devas and Devi are present right now, everyday can be a new annal in Their Glory, who knows - one day in the future we may have a dance contest among many Devas and Devi. Who would be the judge, so many are dancers of renown, e.g. Rasa Lila and other examples. Lord Shiva, perhaps little known to some, is a majestic master at musical instruments, He could play music while Others dance. I have noticed so many examples of the most ancient of temples having Shiva, Vishnu, Brahma and others as Surya all in the Temple complex, in fact it seems it was much more common in very ancient times and "scholars" often use this as a marker of indicating very ancient linage of the sacred site. 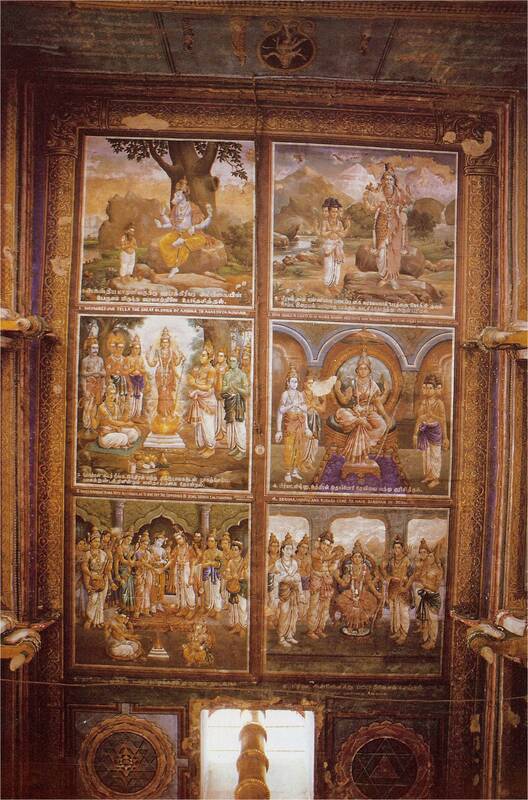 I have discovered Saiva temples with full panels depicting the Ramayana, etc. as well. Of course, today new temples in other countries often have Devi and the Trimurti installed to serve the entire Hindu community. One day I hope to go to Chidambaram as you have, all the more reason to visit and see Vishnu, too!